Microsoft's has introduced its latest mobile offering, Kaizala Pro, to the South African market. Kaizala Pro is a mobile app that improves the way businesses communicate and collaborate. It's designed for large group communication, workflow management, reporting and analytics, and is integrated with Office 365. It also provides actionable information through analytics and reports, while complying with industry security best practices. Unlike other chat-based apps in the market, Kaizala extends beyond a mere communication function. Because many workers in the region often don't have an email address, Kaizala only requires a mobile number to sign a user up. The app is also optimised to work on any network, including slow 2G networks. Its premium features include user and group management, system integration and automation using Microsoft Kaizala APIs, advanced reporting and analytics, the ability to publish custom actions and to create public groups, an organisational profile and directory, and support. With Kaizala, customer's messages, photos, video files, audio files, documents, polls, surveys, and other data is protected by encryption in-transit and at-rest, allowing managers to decide who has access to company data. All Kaizala data is stored in Microsoft Azure datacentres, which adhere to industry standard security and compliance certifications. * Communicate with and manage an unlimited number of users. This includes employees, front-line workers, customers, suppliers and citizens. * Organisations can create flat, hierarchical or discoverable public groups in minutes, from contact lists, directories or ad hoc sharing. For users in remote areas, the app is optimised to work on slow 2G networks and users don't need an email address to sign up, only a mobile number. * Broadcast and collect information in a structured way through action cards. This includes sharing announcements; photos, videos or documents; hosting polls or surveys; assigning tasks; providing training content; marking attendance; and tracking workforces using location tracking. * Gather rich insights from data with built-in analytics. Organisations can view results in real-time, organise large amounts of information with an aggregated view of user responses and get reports at each level of the organisation. Nick Keene, Modern Workplace Business Group lead at Microsoft, says the app addresses several challenges faced by many businesses across the region who manage field staff remotely. "Mobile technology is enabling businesses to embrace the Fourth Industrial Revolution and digitally transform their operations. Microsoft Kaizala is ideal for organisations that need to communicate with large numbers of workers to enhance business agility, collaboration, and organisational productivity," he says. "This means that only you and the people with whom you are communicating can see what you have sent them," says Keene. "Microsoft Kaizala is currently Tier-A compliant and our engineers do not have access to any customer data." By using Microsoft Kaizala Pro, organisations can connect with their employees and the extended value chain. The product offers a simple and familiar chat interface but goes beyond this to make everyone more productive. Kenyan-based solar energy company, M-KOPA Solar, now has more than half a million customers in Kenya, Tanzania, and Uganda. M-KOPA Solar couldn't have achieved this growth without providing the underlying communication and payment technology that people can access easily by phone. M-KOPA uses the Microsoft Kaizala app to connect its sales team and provide essential resources to rural communities. The company has grown from 5 000 customers in its first year to more than 600 000 as of January 2018, more than 120 times the original customer base. This growth is being fuelled in part by the Microsoft Kaizala app. 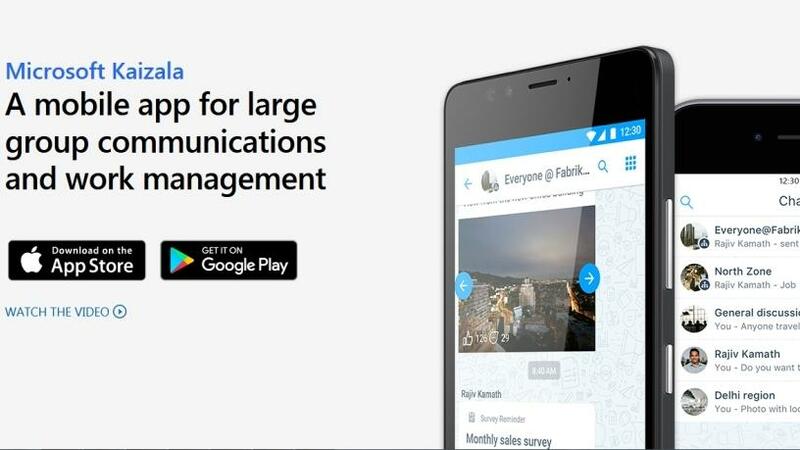 Another company taking advantage of the benefits provided by Microsoft Kaizala Pro, is Well Told Story, which is using the app as a research tool, putting it into the hands of its network of young people to run surveys and interviews for them. This empowers the youth with jobs and income, while also giving Well Told Story the rich insights to fuel its youth media business. "As we roll out Microsoft Kaizala in South Africa, we hope to connect the complete value chain, including the unconnected parts of organisations. Microsoft's vision for Kaizala, is to empower every organisation and community to achieve more through purposeful chat," Keene concludes.